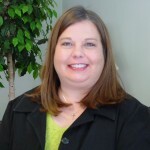 Jennifer Greene has been with our Region Ministry since July 2008 serving as an administrative assistant based at the Region Office. She came to our staff from the Marion County Sheriff’s Department where she served as an administrative assistant for more than 12 years. Jennifer provides administrative support to our staff Region Ministers along with acting as our coordinator for our Church Leadership Institute (CLI), managing our church clerk reporting process, maintaining our database, providing hospitality for our building along with many other administrative duties. She is a native of Monticello, Indiana, but attended high school and currently resides in Franklin Township on the southeast side of Indianapolis. She holds a bachelor of science degree in education from Indiana University—Bloomington, and was a student leader in Campus Crusade for Christ (now known as CRU) participating in conferences and mission trips both stateside and abroad while attending college. She and her husband, Duane, have a son, Zach, who graduated from Wabash College in 2016, and is now studying as a full time grad student in Annapolis, MD.